Another combo disruptor joins the game. 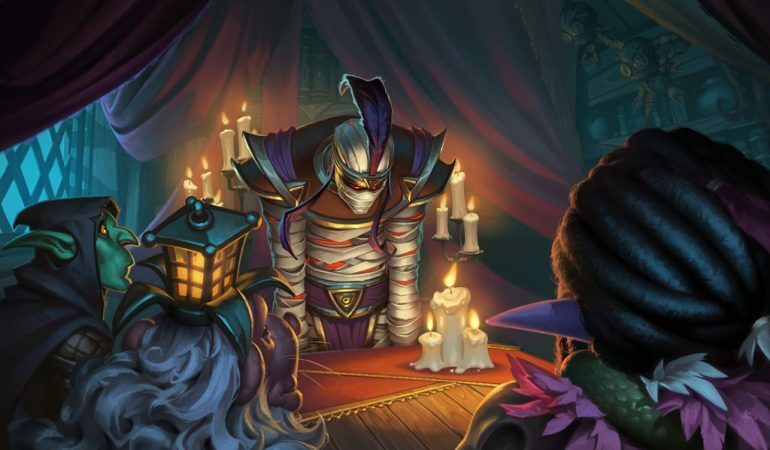 Blizzard has revealed a new Hearthstone spell from the upcoming Rise of Shadows expansion that will help Paladins disrupt combos from their opponent’s deck. Duel! is a five-mana Epic Paladin spell that reads, “Summon a minion from each player’s deck. 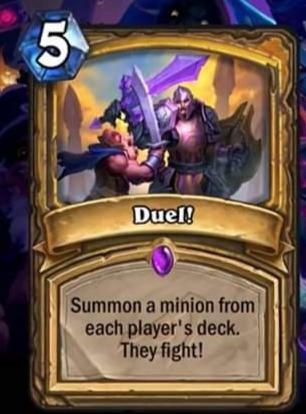 They fight!” This mechanic of forcing two cards to fight each other after they’re summoned from the deck is new in Hearthstone, so players will surely come up with some fun ways to use it. A video shows how the card works. Both minions are chosen randomly for the duel and are placed on the board. As with any card placed with a Summon ability, their Battlecries never trigger, but their Deathrattle might if they die in the fight. Any minion that survives the fight will stay on the board until it’s removed by another card. Duel! will be great at disrupting combos since its user may end up putting a key opponent minion on the board and eliminating it before its effect can be used, or simply wasting a Battlecry that could be a game-changer. Paladins who use Duel! just have to be careful to run decks that rely on big minions and are as independent as possible from Battlecries—otherwise the card may end up ruining their own strategy. Rise of Shadows is bringing Duel! and 134 other cards to Hearthstone when it’s released on April 9. Players who want a good price on their expansion packs can buy them on pre-sale in bundles of 50 and 80 for $49.99 and $79.99, respectively.